1. One-walled: These are kitchens designed on a single side of the wall. It saves a lot of space and is best suited for studio type apartments or lofts. All the different equipments used are usually fixated to the same side of the wall. 2. Galley: This is a type of one walled kitchen with a slim outline ideal for smaller spaces and congested spaces. A walk through kitchen which ideally has 2 parallel walls and all the designs are done on these walls facing each other. 3. L - Shaped: This is another very efficient idea for small apartments and best for utilising space. They can be from 10 to 15 feet long to use the space efficiently. With L shape, you can avoid a lot of cramped spacing however, if the kitchen is bigger, island layout would be a better option than an L shaped. 4. Horseshoe: These U shaped kitchens are the upgraded versions of L shaped and island kitchens which are connected from three walls to forming an island in between. 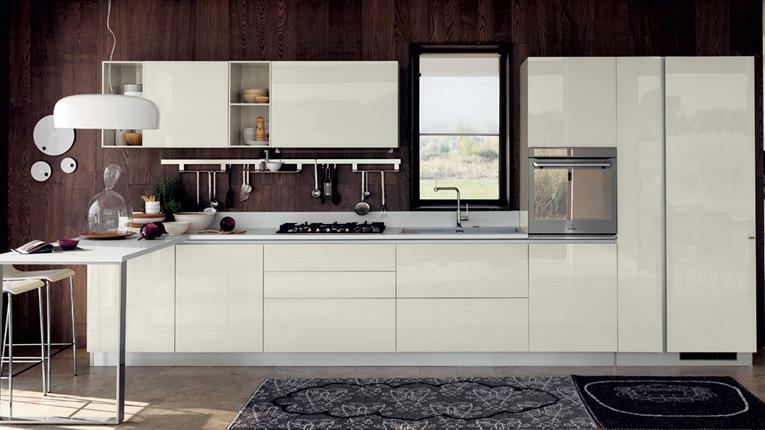 This is a very efficient kitchen because it allows room for more people to work in the kitchen with plenty of spacing. 5. Island: One of the best kitchen designs provided there is a plenty of spacing for the design. This not only allows space for seating, but also a wide sink, a walk through, an eatable place and a large stove. The only disadvantage would be the space required to accommodate the whole design. 6. Peninsular: Last but not the least this is a connection between an island, converting an L shaped to a horseshoe or a G shaped kitchen. Offers a lot of space to the kitchen however does not cover or make up for sharp edges and perfect square.